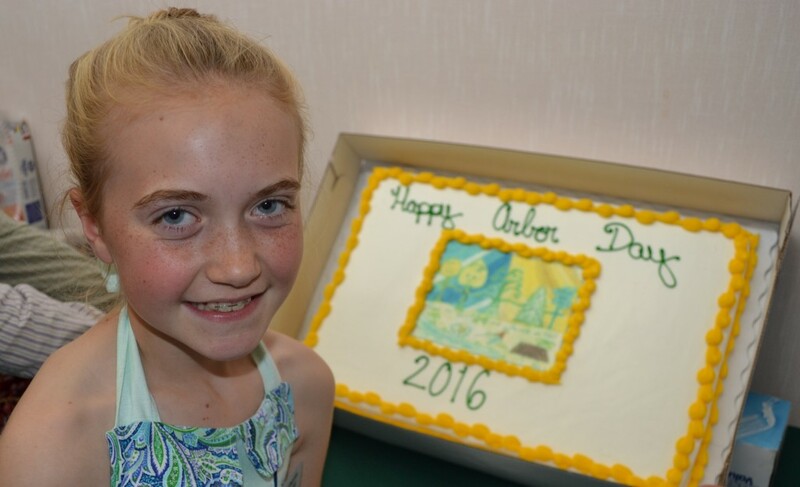 Rain Vasey of Lincoln, Sussex County was the 2016 state winner of the Arbor Day Poster Contest. Each year, Delaware celebrates the last Friday in April as “Arbor Day,” an occasion to plant trees and spotlight the numerous natural benefits that trees provide. First established in the United States by J. Sterling Morton in 1872 (almost a hundred years before Earth Day was introduced), an estimated one million trees were planted in Nebraska on the very first Arbor Day. Arbor Day observances are also an integral part of community recognition programs such as Tree Campus USA, Tree City USA, and Delaware’s Tree Friendly Community Award, as well as qualifying for a financial award from the Urban Grant Program. The Delaware Forest Service sponsors an annual Arbor Day School Poster Contest for Delaware schoolchildren in grades K to 5 for all public, private, home, and charter schools. The winners receive a tree planting at their school, a gift card, a tree-themed book, and an invitation for them and their family to attend the State Arbor Day event with Governor Markell on May 12. Click here to see (high-resolution) images of the 2016 Arbor Day Poster Contest Winners. For more information, contact Ashley Peebles, 302-698-4551 or Ashley.Peebles@state.de.us.